2 Samuel 7 has been called one of the high points of the OT. As king over Israel, David builds for himself a majestic palace. But after completing it, he makes a sobering realization: “I’ve built this palace for myself while the ark of the Lord remains in a tent.” So David sets out to build a temple for the Lord. V9, I will make your name great. V11, I will give you rest from all of your enemies. V12-13, David’s offspring will reign eternally. Filled with God’s promises and David’s praise, this is truly one of the high points in the entire OT. The promises made here will serve as an advance declaration of where this story is going, a preview of coming attractions: there will be a coming son of David who will reign on the throne forever. In David, there is a king on the throne who is God’s representative agent, leading the people in faithful obedience. But if this is the peak of David’s story, unfortunately we know what that implies. If 2 Sam. 7 is one of the highlights of the OT, then we quickly find ourselves at one of its low points in 2 Sam. 11&12. It’s an ugly episode, a scandalous one. By the time ch11 ends, David has violated half of the Ten Commandments. And itt all begins with the one crucial mistake David makes in v1. 2 Sam. 11:1, In the spring, at the time when kings go off to war, David sent Joab out with the king’s men and the whole Israelite army. They destroyed the Ammonites and besieged Rabbah. But David remained in Jerusalem. David has lost sight of his identity as a warrior in God’s service. In Saul’s day, the Israelites would sing this little jingle and it would burrow it’s way into Saul’s brain: Saul has slain his thousands; but David his tens of thousands. David was the one rushing headlong toward the battle line to square off against Goliath. At his peak, David was the kind of man everyone loved; men wanted to be like him and women wanted to be with him. But those days are long gone. David has now settled comfortably into middle age. The hungry warrior has become a complacent king. David has forgotten his identity; he was forgotten that he was a warrior. Let’s stop right here for a minute. Do we need to hear this word? Is there a warning here for us? What is your self-perception? Do you think of yourself in these terms, as a warrior in God’s service? Do you think of yourself as a warrior engaged in an ongoing spiritual warfare? Or do we think of ourselves as something less? We are engaged in a spiritual struggle. This is all over the Bible. Paul says in Ephesians 6:12, Our struggle is not against flesh and blood, but against the rulers, against the authorities, against the powers of this dark world and against the spiritual forces of evil in the heavenly realms. The preceding verse talks about putting on the armor of God so that we can stand against the devil’s schemes. Satan had a plan of attack and he strikes David when he least suspects it. And why is David susceptible to this attack? Because he’s removed his armor; he’s disengaged from the physical battle; but more importantly, he has left himself vulnerable to the spiritual battle around him. Look at what happens as a result of this mistake in v2-5. Because he’s not where he’s supposed to be, David ends up at the wrong place at the wrong time. And that’s how temptation usually works, isn’t it? It’s not a coincidence that temptation hits us when we’re at our weakest, our most tired, our most defenseless. By losing sight of his role as a warrior in the Lord’s service, David has left himself susceptible to temptation. And the same thing happens to us. He’s walking on the rooftop; he sees a beautiful woman bathing; and this is where it all begins to go downhill. He had an opportunity right here to choose wisely. But instead of following the example of Joseph, who fled when he was presented with an opportunity for sexual immorality, David lingers. Question: when sexual temptation presents itself, do you flee? Or do you linger? This is important to say: there’s no indication that David went to the rooftop looking for this; this temptation just presented itself. But by lingering, David waters that seed of temptation and his desire continues to grow. By continuing to look at Bathsheba, David is turning this temptation over and over in his mind. This is where we get into trouble. Unfortunately, sexual temptation is as ubiquitous today as it ever has been. We are a culture awash in sexuality. And to one degree or another, each of us grapples with the difficulty of faithfully stewarding God’s gift of sexuality in a world where longheld norms of sexual ethics are being discarded. Men and women alike are bombarded with temptation. Like David, our hearts beat for God. We want so desperately to do the Lord’s will in our lives. Yet, this is an area where we continually struggle. If that sounds familiar, there is hope. Don’t lose sight of the fact that you are a spiritual warrior in God’s service. Don’t forget who you are. Satan is targeting so many of us; he would love to bring us down. You’ll see the ruin this brings in David’s life — Satan wants to wreak the same havoc in our lives. Don’t let him do it! Reclaim your place as a mighty warrior in service to God. It’s time that we put on God’s armor once again. Giving in to sexual temptation is a sin. Period. You can rationalize it all you want, but it’s a sin. It dishonors God. You’re not alone. Like I said, there’s not a man in here who hasn’t had to deal with this at some level. There is comfort to be found in knowing you have brothers who can relate to your struggles. God can bring victory. Is this giant to great for you to slay, with God’s help? Absolutely not. God has slain greater giants than this. He has brought victory to billions of men throughout history on this very issue. Do you really think you’re so far gone that he can’t help you? If so, let me say this: if you think your problem is too great, then your view of God is too small. On the rooftop, he made a conscious decision to cross the line. You know when you cross that line in your heart, when you give in to the temptation, when you linger. But at this point, he still had an opportunity to repent, to snap to his senses and say, “What am I doing here?” But he didn’t. Once again David has the opportunity to hit the brakes. When he heard the word “wife”, it was another opportunity to jolt him back to his senses. But David ignores this; falls to the same problem that plagued Saul: the delusion that he, in fact, WAS the king over Israel & he could do as he pleased. He takes Bathsheba for himself, violates the Law of God. These are not the actions of a spiritual warrior. Bathsheba sends word that she’s pregnant; David goes into full cover-up mode. He brings Uriah back from the battle line, tells him to go home to his wife, enjoy a few days off. But Uriah refuses. He says, How could I go home while the ark of the Lord and my commanding officer are out there doing battle? Did you notice the designation of Uriah as “the Hittite”? He’s not even a true Israelite, yet his actions are more honorable than Israel’s king. David tries again; once again Uriah won’t go home. So David devises a more insidious plan. He writes a letter to Joab, his commander. And he orders Joab to put Uriah in the worst part of the battle and to withdraw, ensuring his death. In a sadistic little twist, David sends the official decree back to Joab through Uriah; this honorable man has no idea that he’s carrying his own death papers. And so Uriah the Hittite is murdered. But in order to carry out this little plan, a few other people must pay as well. V17, When the men of the city came out and fought against Joab, some of the men in David’s army fell; moreover, Uriah the Hittite died. Did you catch that? Joab couldn’t just put Uriah out there on an island by himself. He had to put other men in harm’s way as well in order to carry out David’s order. And some of these men lose their lives. This means that there are children in Israel who grow up without a father…all because of David’s sin. I told you a few weeks ago that there’s no such thing as partial obedience. Well, here’s a complimentary thought: there’s no such thing as private sin. This is a lie from the bowels of hell. With sin, someone always gets hurt. Sin is systemic in nature — it takes root and bleeds out in a variety of other areas. Every pebble of sin disturbs the surface of the water. Even private rebellion has public consequences. Dead Israelite warriors, also innocent, have no stake in this matter, never even knew they were pawns in David’s little game. Their families. Who is hearing the cries of these widows as they mourn the loss of their husbands? Who hears the cries of these children who must live out the rest of their days without a father, all because David couldn’t keep his temptations in check? Look at the wake of David’s sin; listen to all of these voices and you want to tell me that there’s such a thing as private sin? 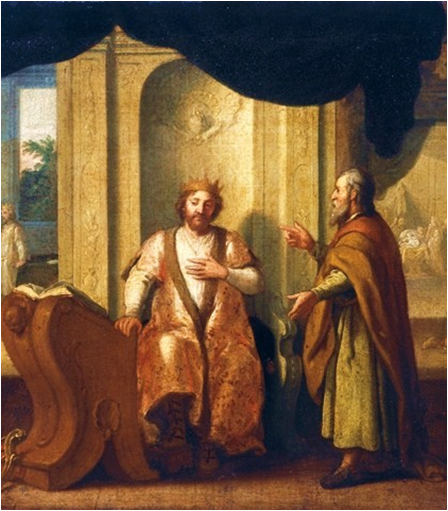 The prophet Nathan confronts David and the king is broken. Although he asks for and ultimately receives forgiveness for his transgressions, the consequences of his sin haunt David for the rest of his days. His story is a painful reminder of the tragic consequences of human sin. Forgiveness can be found, but that forgiveness rarely absolves us of sin’s consequences entirely. David’s story ends on a hopeful note, however. After Bathsheba grieves for Uriah, David takes her to be his wife. Another son is born to them (2 Sam. 12:24-25), a child named Solomon. But the child has another name, Jedidiah, which means, “loved by God.” As the scene closes, this child is a reminder that God’s love – not sin – will have the final word in David’s life. And may God’s love have the final word in our lives as well. This entry was posted in Devotional, Faith, God, Scripture, The Story and tagged 1 Samuel 7, Bathsheba, David. Bookmark the permalink.